The herbs have been growing like mad in the garden and they are finally ready to harvest. I have been spending a lot of time harvesting and drying herbs over the last week and started to run out of room. 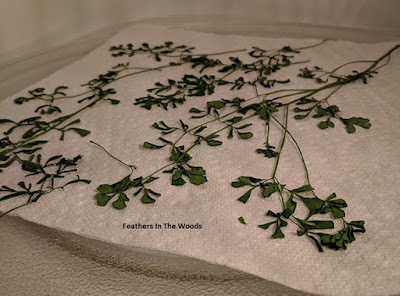 Since my dehydrator was full, I started using my microwave to dry herbs and it is amazing! I have one of those multi tray dehydrators and I use it all the time. It works really well, except it takes hours to dry each batch of fresh herbs and obviously it can only hold so much. When you use the microwave to dry herbs though, each batch is done in under 2 minutes. So you literally never run out of room since it's only just a minute or so till you can put a new batch of herbs in to dehydrate! Plus it's really great to use the microwave to dry herbs instead of a dehydrator when it's already hot outside and I'm resisting turning on the AC. The microwave doesn't blow out warm air like a regular dehydrator does. When it's running for the 8 hours it takes to dry each batch of fresh herbs, that's a lot of extra heat. Drying herbs in the microwave takes much less time than any other herb drying method. Plus, it's easy. It takes about the same amount of effort as using your car as a solar dehydrator...which is not much at all! I like to water my herbs the night before I harvest them. I use a sprinkler attachment on my hose and water from above, basically rinsing them of any dirt or debris. Do this after the hottest part of the day has passed. The water will dry off overnight. Harvest herbs early in the day, after the morning dew has dried up but before the sun is directly overhead. 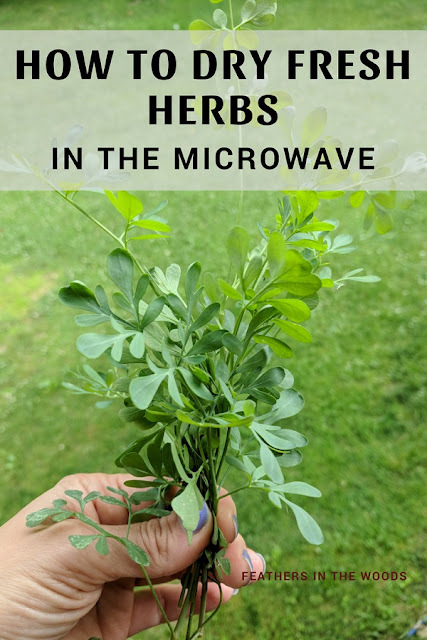 The plants should be clean of debris and dirt but if the herbs need rinsed after cutting, make sure to dry them completely before putting them in the microwave. Place herbs on paper towels in the microwave making sure they don't overlap. Cover with another paper towel. Turn the microwave on high for 30 seconds. 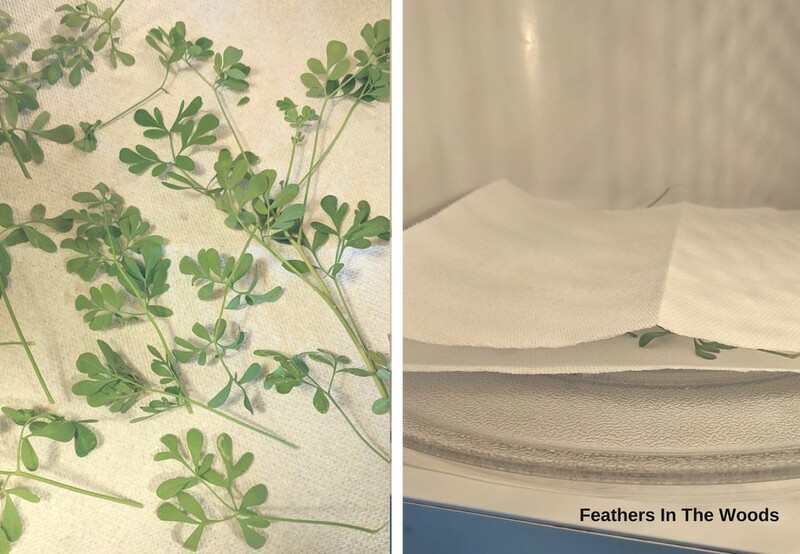 Open the microwave and grab your paper towels and herbs on opposite sides (like an herb/paper towel sandwich) and flip the entire thing so the top towel is now underneath. You might notice some moisture on the top paper towel once it's flipped. The reason you flipped the whole thing is to keep the herbs from sitting in that moisture as they continue to dry. Microwave another 30 seconds on high and then check the herbs for dryness. If they don't crumble easily between your fingers, add another 15-30 seconds. Once dry, remove herbs from the microwave and run your fingers down the stems to remove the herbs from the stem. Store your dried herbs in an airtight container. Here's how I store dried herbs. There are lots of ways to dry herbs that are more traditional herb drying methods than the microwave. The Herbal Academy has a tutorial for making an herb drying screen if you'd like to try that method. The Spruce has a instructions on hanging your herbs to dry. I wrote about how to use your oven to dry herbs and how to use your car as a solar oven to dry herbs. I've tried every single method for drying herbs but honestly don't have a preference. I think what matters most s which method fits into your kitchen best...and if you're pressed for time, microwaving is the way to go!